Kenny Loggins (rhythm & acoustic guitar, harmonica, vocals), Jim Messina (lead & acoustic guitar, mandolin, dobro, vocals), Larry Sims (bass guitar, backing vocals), Jon Clarke (oboe, steel drums, flute, tenor & baritone saxophone), Lester "Al" Garth (fiddle, recorder, alto & tenor saxophones, steel drum), Michael Omartian (organ, piano, keyboards, clavinet, concertina, steel drums), Victor Feldman, Milt Holland (percussion), David Paich (keyboards), Merel Bregante (drums, backing vocals). In 1977, after a plethora of gold and platinum rock albums & hit singles, Columbia honored Kenny Loggins & Jim Messina (Buffalo Springfield / Poco) with their huge greatest hits collection, the platinum plus "The Best Of Friends". 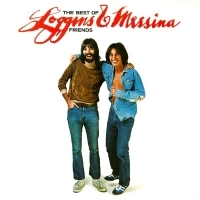 The limited edition 180 Gram Audiophile red vinyl release of the Loggins & Messina classic "The Best Of Friends" is another installment in the Loggins & Messina Friday Music series. The album master is impeccably prepared for vinyl release by Joe Reagoso at Friday Music and Capitol Mastering. Stunning gatefold artwork, including the groundbreaking LP cover photo, new liners from Kenny and Jim, as well as a 24" x 24" poster of the front cover art are included in this exclusive presentation.